Speaking with the 26-year-old singer recently, it’s clear how serious he is about his craft and artistry—two words not commonly used within the manufactured confines of K-pop. 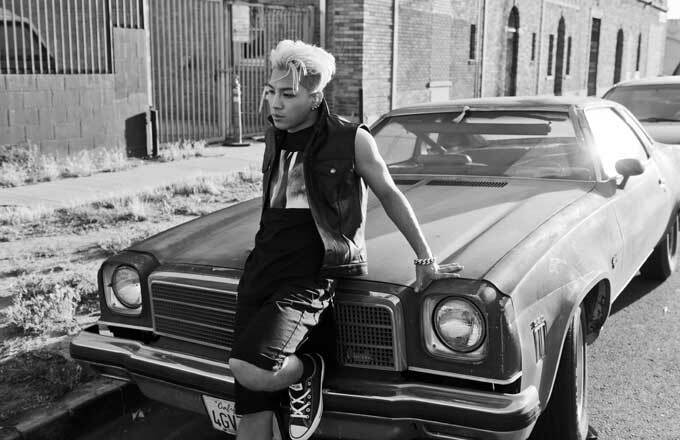 In our interview, Taeyang was characteristically candid and unguarded about his career. So why did it take him four years to release his new album? Which American artists is he listening to lately? What’s up with new music from Big Bang? And will he ever leave his record label? He answers all of these questions and more in this exclusive Complex Q&A. How&apos;s the reaction been to your new album, RISE? Luckily, the reaction has been very good. I&apos;m happy about that. Are you happy with the music? Did it come out the way you wanted? To be honest, it&apos;s a little different compared to the initial concept I had when I started the album. The last time we spoke, you said you wanted to make every track off the album as if it were a single. Did you fulfill that goal? I&apos;ve worked on numerous tracks and out of those tracks I&apos;ve handpicked nine songs. I think each song definitely stands out, but as a whole, there are some elements that leave more to be desired. There was a four-year hiatus between RISE and your last solo album. Was that due to your record company? There were definitely demands from the company. So it took longer to complete the project. We ended up making a diverse array of tracks. And those that were approved became a part of the album. There must be a measure of satisfaction now that it has finally been released. I can never be satisfied. It took a long time for this comeback. I&apos;ve wanted to showcase a lot more, because I wasn&apos;t able to put out all the songs I&apos;ve worked on. There are some feelings of regret. If you have to pick out a specific song that stands out to you the most, what track would it be? The last track, "Love You to Death." I think that sound best reflects my personal taste in music right now. Of course, I like all the tracks I have on the project, but my personal favorite is track nine. How did that track come about? I worked on that record in Los Angeles with producer Happy Perez. I was out there with Choice37 and had a five-day session with Perez. We&apos;ve worked on a lot of records together and I like all of them, but I felt like the sound of that particular record was new for the Korean audience. The company didn&apos;t like it that much, but I pushed it, and we ended up having that track on the album. Are there roadblocks in the Korean market because of your musical taste? I wouldn&apos;t say they&apos;re roadblocks. It&apos;s more so a process of figuring out how to merge the sound I like for the market out here. My personal taste is closer to the underground. It&apos;s been out for a while, but I like The Weeknd&apos;s Kiss Land a lot—though I definitely liked his mixtapes more than the album. I&apos;m also a fan of SZA. Oh, and Michael Jackson&apos;s Xscape. You&apos;ve mentioned how much of an influence MJ was to you as an artist. How did it feel listening to his posthumous album? It was really sad. I felt very emotional listening to that album. I listened to "Love Never Felt So Good" and thought, "If Michael was alive, I wonder if he&apos;d want to this be released." It was a mixture of various feelings. I was sad that he&apos;s no longer here with us. To me, the first single didn’t feel like a complete record. It felt a bit like a demo in terms of the sound and the lyrics. I was very happy to hear his voice though. I get inspired just by listening to his voice. Let’s get back to your album. The lead single "Ringa Linga" came out in November 2013, but there were no more singles for the next seven months, when RISE was released. The company held it back. [Laughs.] But the fans know. The album was prepared back then, and starting with "Ringa Linga" we wanted to put out records one after the other, and then release the album. I don&apos;t think the company was certain about my album. The company asked me to work on more records, and because I wanted to put out this album so much, I concentrated on making more tracks. That&apos;s how the single "Eyes, Nose, Lips" came about. I&apos;d love to talk about the music video for that. It kind of reminds me of D&apos;Angelo&apos;s "Untitled." But it is also refreshing because in K-pop, music videos are usually very fancy and loud. I like the fact that it was so simple yet detailed. Yes, that&apos;s completely right. If you look at the tracks released from my previous album, either the performances were really flashy, or the video sets were very well-produced. But for a track like "Eyes, Nose, Lips" I wanted to make something simple. I felt like that was the best way to relay the record&apos;s emotion. So we decided on the idea of completing the video in one take. And people around me said I look better when I take my shirt off, so that made it more interesting. It’s a great love record. Speaking of: What’s your real love life like as of late? I can tell you that I don&apos;t really reminisce about my past relationships. I&apos;ve been seeing a lot of…well, I wouldn&apos;t say a lot. Nothing wrong with a lot. Personally, if I like someone I&apos;m pretty earnest with that one person. So I&apos;ve dated only a few over the years. And you know, it&apos;s been really good. I&apos;m not as much tied to my past. I&apos;ve sought after newer emotions. And it&apos;s good to share those various feelings through music. When you released your first solo album in 2010, there weren&apos;t many commercial K-pop artists with an R&B sound. As of late, singers like Zion T and Crush are helping popularize the genre. I&apos;m actually a big fan of Zion T and Crush. I think they&apos;re very impressive. They’re very clear about their artistic identities. It&apos;s not easy to pursue that style of music and gain a strong fandom in Korea, but they&apos;ve been successful at it. And I applaud them. Especially Crush, I&apos;m pretty close with him. We hang out, go out to eat, and I consider him a friend. It&apos;s also interesting that both of your albums came out around the same time. Did you check out Crush&apos;s Crush on You? Yes, I did. I thought it had a great R&B sensibility, and it also had this youthful energy that was very refreshing. So what&apos;s the latest update on Big Bang’s music? We&apos;re currently working on a new Big Bang album. If it&apos;s early, you&apos;ll hear something from us sometime in the fall. What can the fans expect from this upcoming Big Bang release? It&apos;s really hard for me to say. We&apos;re still in the process of figuring out what style of music we want for the group. So instead of having this grand theme for our sound, I think it&apos;ll make more sense for us to compile a collection of records and then figure out how we want to package it as an album. K-pop is changing, it seems—there are more acts that can hold their own musically and I&apos;ve noticed more artists with hip-hop influences. There are definitely a lot more artists in K-pop now with strong individuality. And it&apos;s a great thing. Especially in the Korean music system, it’s not an easy feat. It&apos;s a slow process, but it&apos;s good to grow and develop those types of artists in the K-pop scene. Even myself, I believe that as an artist I should pursue more independent activities. If more artists believe in this and are active about it, they will be able to accomplish more on their own, without the influence of entertainment labels. So I think it&apos;s a very positive shift. How long have you been with YG Entertainment, your record company? About 14 years I think. Wow, even for those who work regular office jobs, that&apos;s a pretty long time. Ever feel the need to move towards something of your own? Realistically speaking, I still have about two more years left on my contract with the company. And it doesn&apos;t matter where I end up I&apos;m going to do my best to fulfill my responsibilities. Plus, I&apos;ve spent half of my life here at YG, so more than any other place in the world this is the most comfortable place for me. And there are too many people here that I love, and I&apos;ve known since my childhood, so it wouldn&apos;t be easy for me to leave. But, as an artist, if the only way to improve myself were to leave this place, then I welcome that idea. I&apos;m not talking about obtaining more fame or popularity. I&apos;m talking about the artistic choices I have to make as a musician. I don&apos;t think I&apos;m at that point yet. I have a lot of concerns about how to go about my career moving forward. But if I can accomplish all those things here, then that&apos;d be wonderful. At the same time, I do have concerns that might not be possible here. If I feel like I&apos;m not influencing anyone here as an artist, I&apos;d like to notice it before someone else tells me. Then I&apos;ll leave to pursue my own path. Whereas American pop stars can continue dominating the charts in their 30s and 40s, K-pop stars tend to disappear at a certain age. Do you have any concerns about that? Actually, I was very concerned about that when I was younger. But these days, I don&apos;t worry about it. When I look at the life of those artists I admire, I believe that age isn&apos;t a big factor. As long as I have the capacity to accept a wide range of music, and have the ability to produce and make new music, I think I&apos;d be okay as an older K-pop artist. There were a lot of articles about you at various fashion shows over the past year, but it seems like you’re keeping things more simple these days. That&apos;s what I like. Keeping things simple. Beanie, gold chain, Timberland boots. The articles were regarding my appearance at events and fashion shows, when I had to dress up. But normally, I like to keep things simple. Lately, I&apos;ve been wearing Converse Chuck Taylors and just Timberland boots. Is there anything you&apos;d like to add? Nope, I think that&apos;s about right. Jaeki Cho KakaoTalks with all of your favorite K-pop stars. He&apos;s on Twitter @jaekicho.